Has he got Meddling Monk envy? Sue: Can we watch the new Matt Smith episode again instead? Sue: But I need to discuss my River Song theory with you. Me: I’m not falling for that old chestnut, Sue. Come on, we have to crack on. Do you want to be stuck in the 1960s forever? Sue: Okay, so what’s this one called? Me: I can’t tell you. Even the fans can’t agree on an umbrella title for this story. The title we used to use is technically incorrect, and while the truncated version is definitely better, it’s still a massive spoiler. It’s probably best you don’t know. Let’s call it ‘War of God’ and we’ll see if it catches on. Sue: I wish I hadn’t asked now. Oh well, as long as it isn’t 12 episodes, I don’t care what it’s called. Sue is devastated when Terry Nation’s name fails to appear in the titles. Sue: Damn. I was looking forward to a foot-rub. The Doctor and Steven have arrived in 16th-century France. Sue: Is this a historical? Sue: A proper historical, without any time-travelling aliens? If I tell her to wait and see, she’ll only waste an episode looking for the Meddling Monk, and we’re going to have enough trouble dealing with someone who looks like a Time Lord in a habit as it is. I suddenly remember Eric Thompson is in this story, and I’m about to engage Sue in one of our little games, when I instinctively decide against it – she’s going to need her wits about her if she’s to concentrate on this recon. In the end, I’m glad I didn’t, because once you realise it’s him, it’s impossible not to hear Dougal, Florence and Zebedee in various states of distress whenever Gaston opens his mouth. Sue: This isn’t very funny, is it? Me: I don’t think it’s supposed to be funny. Sue: Really? 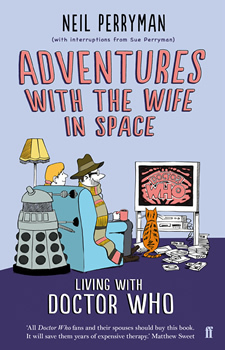 I thought that’s what Doctor Who did now: amusing romps with famous historical figures. The Romans and The Myth Makers (and, to a certain extent, The Time Meddler) have set a jolly precedent for Sue, so she’s crestfallen when the tone word for this story turns out to be ‘glum’. While the Doctor visits an elderly scientist, Steven gets embroiled in a complicated plot involving the Protestant Huguenots and the dastardly Catholics. Sue: Steven is such a bloke, isn’t he? He’s got the whole of Paris to explore but he’d rather spend the day in the pub. Sue begins to fidget as the episode draws to a close, but then a left field cliffhanger throws her for a loop. Sue: Eh? Is that the Doctor? Me: That would be telling. Sue: At least it’s an interesting plot development. Me: Here’s something that may interest you – that was the very first episode of Doctor Who to be directed by a woman. Sue: That’s fabulous. Now if only I could see her direction, I might be able comment on it. Sue: I know what’s missing. Me: Aside from the moving images, you mean? She’s right. The Loose Canon recon is superb – we can even watch it on our plasma TV without flinching – but we’re used to hearing Peter Purves filling in the blanks. And there are plenty of them to fill. There’s even a half-arsed sword fight that takes place in complete silence. Me: Don’t worry, we’ll watch the next episode with a synced copy of the remastered soundtrack tomorrow night. It may help. And then, approximately six minutes in, our experiment reaches a very important milestone. It was the absence of confused questioning, especially when Hartnell reappeared as the Abbot, which finally alerted me to her slumber. That and the snoring. Sue blames the usual suspects: the warm weather, the late start time (it was nearly midnight before we began), even the bath she’d had earlier. Apparently, when your core temperature reaches a certain point, and you quickly cool it down again – in other words, when you emerge from a hot bath – you become very susceptible to the advances of Morpheus. It’s something to do with your body conserving energy, or maybe it’s a hibernation instinct. Either way, never let it be said you never learn anything new when you read this blog. Try it yourself the next time you find yourself suffering from a bout of insomnia – it’s quicker than Galaxy 4 and a lot more fun. Incredibly, Sue didn’t blame the recon for her little snooze, although she did admit it probably didn’t help. Sue: We’ll have to watch it tomorrow. I’m sorry. 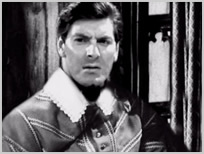 When we re-started the episode the next day, I synced the remastered soundtrack – featuring the ever-dependable Peter Purves – to Loose Canon’s excellent visuals. Sue: So everyone dies at the end? As the plot thickens, I can sense Sue’s growing discontentment. Sue: I might be a bit thick but I haven’t got a clue what’s going on here. Who are these people? Am I supposed to know what the political situation is in France at this moment in time? Do I have to read Wikipedia before we continue? Me: Don’t worry, I think we’re supposed to identify with Steven’s confusion. Because this is a recon, Steven looks permanently confused. There’s one puzzled expression in particular that’s repeatedly used to illustrate his bemusement, and it reassures us both it’s perfectly okay to be baffled. So I baffle my wife some more. Me: What do you think of the new companion? Sue: (Pointing at Anne) She’s the new companion? Me: Of course she is. Haven’t you worked out how this show works yet? Either they replace a departing companion in the same story, like when Steven took over from Ian at the end of The Chase, or they do it in the next one, like when Vicki replaced Susan. That’s how it works. Sue: Her accent will probably get on my nerves after a while. We’ll have to wait and see. What’s her name again? Sue: No, sorry, doesn’t ring a bell. Sue: Why is the Doctor pretending to be a monk? Has he got Meddling Monk envy? Me: He isn’t the Doctor. Sue: What do you mean, “He isn’t the Doctor”? Don’t be ridiculous. Me: William Hartnell isn’t playing the Doctor this week. Sue: You could have fooled me! He looks and sounds exactly like him! Sue: And if it isn’t him, what’s the point? Are we supposed to believe the Doctor just happens to be the spitting-double of the bad guy? What are the chances of that? Me: I shouldn’t have told you. I’ve spoilt it for you. Sue: I would have found out sooner or later. It’s a stupid idea. It doesn’t matter when I find out about it. Me: The thing is, I think we’re supposed to know he isn’t the Doctor. 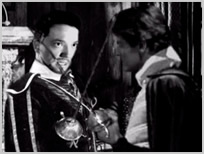 At the beginning of the story, someone outside the tavern recognises him, which implies the Doctor must look like somebody in the vicinity. 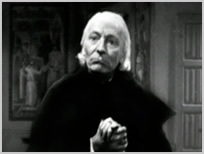 Secondly, William Hartnell is credited as the Abbot, not the Doctor. The last time he impersonated somebody in historical France, he wasn’t credited as the person he was impersonating, was he? And finally, he might not be playing the part exactly the same way. Sue: What a load of rubbish. He sounds exactly like the Doctor! Me: Yes, but we only have his voice to go on. Did he move his hands differently, for example? You know what Hartnell is like with his hands. And to be fair, he does sound like a different man on a couple of occasions. Sue: I’m not convinced. It’s a stupid and pointless twist. Oh dear. I think I’ve broken The Massacre. We decide to crack on (“Let’s get this over with”), but Sue is lost to us now. She can’t keep up with who’s who (“Is he the king? No? Okay, so is he the king?” – and repeat), and she only becomes engaged in the plot again when Catherine de’ Medici reveals herself to be one bad Queen Mother. And then the Doctor turns up. Sue: He’d better have a bloody good reason for leaving Steven in the lurch like that. She almost explodes when the Doctor brushes the affair under the carpet, claiming he was held up somewhere. Sue: Held up? HELD UP? Is that all he’s got to say? He’s been gone for DAYS! Me: It is a little odd. Sue: A little odd? It’s a cop-out! The Doctor wants to know the date. When Anne tells him, he becomes very flustered indeed. Sue: Is that date supposed to mean something to me? Me: Not unless you’re David Starkey. 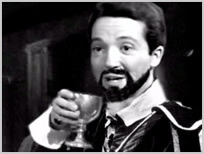 Sue: I’m guessing that all the Huguenots will be massacred during the celebration of St Bartholomew. Am I right? Me: What a bloody good guess. When the TARDIS escapes from Paris, leaving Anne behind, Sue punches me in the arm. Sue: They didn’t replace Sara. It’s still just the two of them. You lied to me. Steven has an almighty row with the Doctor about leaving Anne behind to die (and quite right too), and when the TARDIS lands in 1960s London, Steven storms off in a huff. Sue: I thought the Doctor couldn’t steer the TARDIS? Sue: So it’s just a coincidence that we’re back on contemporary Earth where Steven lives? Me: Steven is an astronaut from the future! Sue: Oh yes, so he is. In that case, he’ll be back in a minute. And then Hartnell delivers one of his best (and probably least known) soliloquies as he’s left to contemplate his fate. He is companionless for the very first time and it’s a heartbreaking scene. Sue and I both agree that it’s probably Hartnell’s finest moment so far, and it’s frustrating that we don’t get to see it. We especially enjoy the way he forgets, and then corrects, Ian’s surname. And then, just as the episode threatens to wallow in its own self-pity, a young Mancunian girl barges into the TARDIS. Sue: Who the hell is this? And why isn’t she surprised to be standing in a box that’s bigger on the inside? Is she tripping? Steven comes rushing back – apparently the police are on his tail – and the Doctor dematerialises the TARDIS without a moment’s thought. Sue: He’s just kidnapped a girl from Wimbledon Common. Does anyone have a problem with this? Me: I told you we’d get a new companion. Dodo is short for Dorothea Chaplet, which convinces Steven and the Doctor that she could be related to Anne. Sue: So the Doctor will only pick up women who remind him of Susan, eh? I bet Anne wishes she’d cut her hair now. Probably as they sliced her head off and stuck it on a pike. Sue: I didn’t like that one at all. They should have sent Hartnell on holiday if they wanted Steven to have an adventure on his own. I still can’t get over why they had to confuse what was already a very confusing story with that stupid bloody twist. Sue: Yes, they were great, but they don’t make up for the other 90. What a waste.